If you are already using Myscript’s CDK 3.0 REST API. You may find useful to consult the migration guide. Call to the REST API of the iink SDK allows you to easily recognize digital content from your already collected strokes. The REST iink recognition API consists of one REST endpoint which takes charge of all types of recognition. Each call to the API allows you to perform iink recognition and output in the requested format. The swagger 2.0 API specification of the iink SDK REST recognition is embedded in the REST endpoint. You can reach it getting <host_of_rest_endpoint>/api/v4.0/iink/batch/api-docs. For example, the Swagger specifications of MyScript’s cloud production environment can be reached here in a raw format and here using SwaggerUI. The setting of the output format respects HTTP standards. The required mime type of the recognition result must be set in the Accept HTTP header . Available mime types depend on the recognition type. The recognition service will choose the first available mime type of the list as the output mime type and set accordingly the Content-Type HTTP header of the response. Because the error output is in JSON format, application.json MUST appear in the list of mime type in the Accept HTTP header. Example of valid Accept HTTP header for text recognition : "application/vnd.myscript.jiix,application/json". Please find a list of available output formats there. In order to use the iink REST API, you have to register on MyScript Cloud to get both an application key and an hmac key. The concatenation of the application key and the hmac key as the user key. The resulting code has to be set in the hmac header of the HTTP request. Jiix is a common JSON format introduced by MyScript that can be used as an output for every type of recognition. Its content can be parametrized in the configuration. The mime type of Jiix is application/vnd.myscript.jiix. You will find complete request bodies in the Swagger-ui or in the examples listed below. xDPI and yDPI have a default value of 96. You should not use other values apart from special needs. 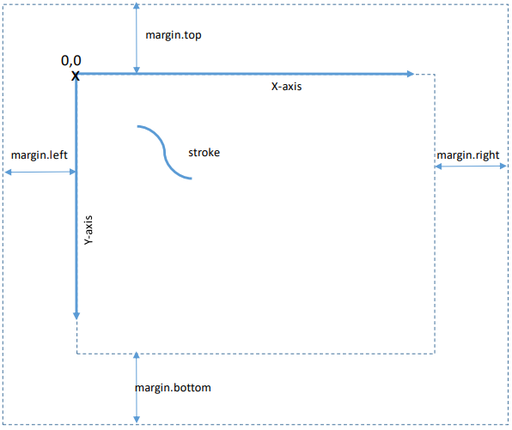 width and height if omitted will be automatically calculated using the strokes and the potential margin configuration. Any x and y coordinate has to be calculated from the starting point as described below. There is no bottom margin for a text recognition. The optional t array contains the timestamps in milliseconds of the points of the stroke. There is no need for them to represent the exact epoch time of the point as the recognition engine will treat each of them in comparison with the first one. The optional p array describe the normalized pressure for each stroke point. Pressure values must respect 0 < value < 1. You can assign an optional id attribute to the stroke. This feature is for future uses. You can provide an optional pointerType attribute to the stroke. Allowed values are “PEN”, “TOUCH” and “ERASER”. The default value is “PEN”. You can provide an optional pointerId attribute. The pointer id identifies the device that was used to write the stroke (the id of the stylus or pencil, the finger that is moving in case of two-finger touch, …). by setting CSS classes in penStyleClasses. The listed CSS classes have to be defined in the general theme attribute. references to CSS classes of the theme in the penStyleClasses attribute. More on CSS styling can be found in the Styling reference page. Here is an example of the iink input for a series of three strokes, the last one being not of the same color as the two first. ISO 639-1 two-digit code of the language. ISO 3166-1 two-digit code of the country. For example, use en_US for American English. Supported languages list for iink SDK 1.3 is available here. You can customize the text recognition using custom resources that you priorly built. You can also set your own custom lexicon for each call. Please refer to the configuration guide for an exhaustive list of configuration options for the Text recognition. Here is an example of Text recognition. Regarding the Microsoft Office clipboard format, saved as a file at a location you define. It is up to you to place it into the clipboard using the Art::GVML ClipFormat key. Note also that Microsoft Office does not support pasting content from the system clipboard on all platforms. You can customize the text recognition in the Diagram using custom resources that you priorly built. You can also set your own custom lexicon for each call. Please refer to the configuration guide for an exhaustive list of configuration options for the Diagram recognition. Here is an example of Diagram recognition. Equations sent to the iink SDK can also be solved. If the solver is enabled, the equation will be solved automatically for the application/vnd.myscript.jiix output (the answer node will be marked as generated) and upon conversion for the other output formats. You can provide the text of the grammar in the configuration (configuration.math.customGrammarContent). This gives you the opportunity to construct it dynamically. You can upload a grammar resource using the admin UI and provide the id in the configuration (configuration.math.customGrammarId). We incite you to choose this solution if you have a predefined set of grammars. Please refer to the configuration guide for an exhaustive list of configuration options for Math recognition. Here are some examples of Math recognition. The raw content recognition of the iink SDK enables analyzing unstructured inks to separate parts that correspond to structured text from parts that do not. Those parts can be retrieved in the application/vnd.myscript.jiix. By setting configuration.raw-content.recognition.text to true, text recognition will be performed on the text parts. By setting configuration.raw-content.recognition.shape to true, shape recognition will be performed on the non-text parts. Please refer to the configuration guide for an exhaustive list of configuration options for the Raw Content recognition. Here is an example of Raw Content recognition. For Diagram recognition, texts and shapes are replaced by a typeset equivalent. The recognition server uses the elements of the theme to determine what font to use. You can see an example of the effect of conversion in the Diagram example. For Math recognition, conversion solve a solvable equation in all output format if the Math solver is enabled. You can see an example of the effect of conversion in the Math example. Conversion remove all the stroke of the jiix output, even if strokes are asked in the configuration. In that case the strokes will be present but the array will be empty. No conversion is allowed for the Raw Content recognition. Any call to the Iink REST SDK returns the 200 HTTP code if everything goes smoothly with the ouput result in the body of the response. The Content-Type HTTP header is set accordingly to the output format. When it is relevant, a location of the error is provided in the message. In that location informations the first index of arrays is 0. 400 recognition.invalid.stroke There is a problem with the structure and/or the values in the definition of a stroke. That can be arrays not having same size or empty stroke or coordinates outside the writing area (too big or negative). 400 recognition.stroke.empty A stroke is empty. 400 recognition.stroke.missing.array A mandatory array is missing in a stroke. 400 recognition.stroke.wrong.array.size An array has a wrong size. In a stroke, X, Y, P and T arrays must have the same size if they are provided. The reference for the excepted size is the X array. 400 recognition.stroke.null.value There is a null value in an array of a stroke. 400 recognition.stroke.negative.value There is a negative value in P or T array in a stroke. 400 recognition.stroke.timestamp.too.big A time value in a T array of a stroke is beyond the maximum timestamp. 400 recognition.stroke.chronological.error Two sequential time values in a T array do not respect chronological order. 400 recognition.no.strokegroup.found There is no strokeGroup in the payload. 400 recognition.strokegroup.empty There is no stroke information in a strokeGroup. 400 recognition.invalid.pointer.type The pointer type was not set with an authorized value. 400 recognition.limit.exceeded The ink that was sent exceed the capacity of the recognition engine. It is likely that the ink contains too much strokes that cannot result in astructured document. 400 configuration.resource.not.found The resource you used for the recognition was not found. It has to be built before recognition. 400 configuration.resource.duplicate.math.grammar Two math grammars were provided, one by id and one by content. There can be only one math grammar provided for a math recognition. 400 configuration.resource.bad.grammar There are compilation errors in the provided math grammar. 400 configuration.invalid.theme The provided theme is not valid CSS. 400 configuration.invalid.pen.style The provided penStyle is not valid CSS. 400 configuration.invalid.pen.style.classes One of the provided penStyleClasses does not refer to a class from the theme. 400 configuration.invalid.conversion.state The conversionState is invalid. 400 recognition.conversion.state.not.supported The conversionState is not valid for this type of recognition. 400 api.json.error The body of the request is not valid JSON. 400 api.missing.invalid.parameter A mandatory parameter is missing. 400 api.unrecognized.property An unrecognized parameter has been found. 400 api.invalid.format A property doesn’t have the required format (for example int instead of string). 400 api.mapping.error General JSON mapping error. 400 access.payload.too.big The payload size exceeds the server limits. 401 access.not.granted The application key does not exist or the HMAC signature is invalid. Please refer to documentation of credentials. 403 access.account.counter.threshold.reached A counter of your application has reached aconfigured threshold. Please refer to the pricing page. 403 access.account.disabled The account that owns the application key is disabled. Please contact support or use another application key. 403 access.account.expired The account that owns the application key has expired. Please consider registrate another account or use another application key. 403 access.account.not.activated The account that owns the application key is not activated. Please contact support or use another application key. 403 access.application.deleted The account that owns the application key has been deleted. Please consider registrate another account or use another application key. 403 access.application.disabled The application relative to the application key is disabled. Please contact support or use another application key. 403 access.invalid.application.key The application key has been revoked. Please consider registrate another account or use another application key. 403 access.bad.ip.address The call to the API is not granted from this IP address. Please contact support. 403 access.bad.referer The call to the API is not granted for this HTTP referer. Please contact support. 403 access.empty.cartridge Your cartridge is empty. Please refer to the pricing page. 403 access.empty.global.cartridge The global cartridge of your site is empty. Please refer to the pricing page. 403 access.invalid.language The asked language is not authorized for your application. Please control that the language code you provided exists or refer to the pricing page or contact support. 403 access.ip.filter.rejected The IP address of the caller does not match the set IP filter. Please contact support. 403 access.mandatory.parameter The application relative to the application key is configured to need a mandatory parameter. Please contact support. 403 access.quota.exceeded A qouta has been exceeded for the applicationrelative to the application key. Please contact support. 403 access.recognition.type The application relative to the application key does not have access to the asked recognition type. Please contact support. 403 access.revoked The application relative to the application key has been revoked. Please consider registrate another account or use another application key. 403 access.userid.missing The application relative to the application key requires an userID. Please contact support. 416 recognition.no.suitable.mime.type No mime type acceptable for the type of recognition was found in the Accept HTTP header. Please refer to the docupentation to find out what mime type you can use. 500 internal.error Internal error. Please contact support and provide the corresponding message.